Paul Gauguin was a French Post-Impressionist artist. 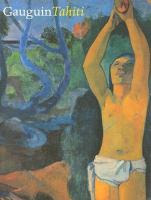 Now through April 29, 2012 the Seattle Art Museum will exhibit 50 of Gauguin's works. On display are his paintings, sculpture, and works on paper which reveal the influence of Polynesian culture on his work. Gauguin was influenced by folk art and Japanese prints which is evident in much of his work. Eventually he found his way to Cloisonnism, the painting with flat areas of color and bold outlines and then to the style of Primitivism. 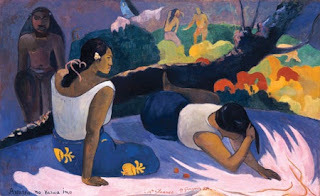 "To commemorate the centenary of Paul Gauguin's death, the Musee d'Orsay (Paris), and the Museum of Fine Arts (Boston) assembled a major exhibition of Gauguin's works from his travels in Polynesia. This catalog effectively documents that exhibition, while summarizing and contributing to the scholarship on a subject that is central to the history of modern art. Gauguin's voyages were the stuff of legend, motivating generations of artists to embrace their "savage" side and to travel." (from Choice). "This is a new view of Gauguin, revealing his origins in Peru in a family of anarchists and revolutionaries and examining his life with his youth placed in context. The book is set against the panoramic background of an era of rapid change, from the rise and fall of Napoleon III to the opening years of our century. At the same time, this superlative biography offers an intimate portrait of the age of the Impressionists and Post-Impressionists, an age brought vividly to life through a vibrant cast of characters - Manet, Monet, Renoir, Degas, Pissarro, van Gogh, Mucha, Debussy, Mallarme, and Strindberg. Above all, it describes a life of unexpected twists and turns, moving from Gauguin's luxurious childhood in Peru, through his wartime adventures as a sailor, to his years as a financial speculator in Paris, before he plunged into art and traveled across the globe, finishing his days on a remote island in the vast emptiness of the Pacific Ocean." "At the end Paul Gauguin became a drug addict and died of syphilis only days before he was to be thrown into prison, yet his art lives after him. How it should be judged in the light of its creator's extraordinary life is the challenge offered to readers of this comprehensive biography." (from book jacket). Paul Gauguin was thirty-five when he made the momentous decision to abandon his lucrative career as a Paris stockbroker and devote himself full-time to painting. Gauguin's bold use of flat, unmixed color gave his paintings a strong sense of personal expression, but his work struggled to find acceptance at the time.